I've been hinting around here about some big changes and I'm finally ready for the big reveal. Recently I left my job - one I'd been at for about 4.5 years - and started a new position as pastry chef and baker at a brand new whole foods/gluten free/nut free/organic restaurant opening up in Saskatoon. Talk about changes! I haven't worked exclusively in pastry for a long while, but if you've been hanging around this blog long enough you know how much I love baking. Granted, gluten free baking is completely different. And challenging. But it's also incredibly fascinating. I'm getting to know my different flours and how they interact together. I'm baking with brand new ingredients like xanthan gum, arrowroot and agar flakes. Because the restaurant is refined-sugar free, my sweeteners of choice are maple syrup, cane sugar and coconut sugar. And almost every single ingredient in the kitchen - from the chicken to the chickpeas to the chocolate- is organic and I love that. We will be making absolutely beautiful, healthy and delicious food. I'm super busy, getting to know the new products (and the ins and outs of a new kitchen) but also thriving. My brain is happy learning new things! My co-workers are so kind and funny and amazing professionals. I'm honoured to be amongst their expertise. We know we are onto something special, and without a doubt will be taking Saskatoon by storm. Because I'm a geek keener, the few days before I started my new job I did a little recipe testing of my own. While these exact recipes won't be used in the restaurant, I'm happy to share them with you today. And please, if you are gluten free and want to share any information with me, share away! I'd love to know any good resources/recipes you have that you think I might benefit from. 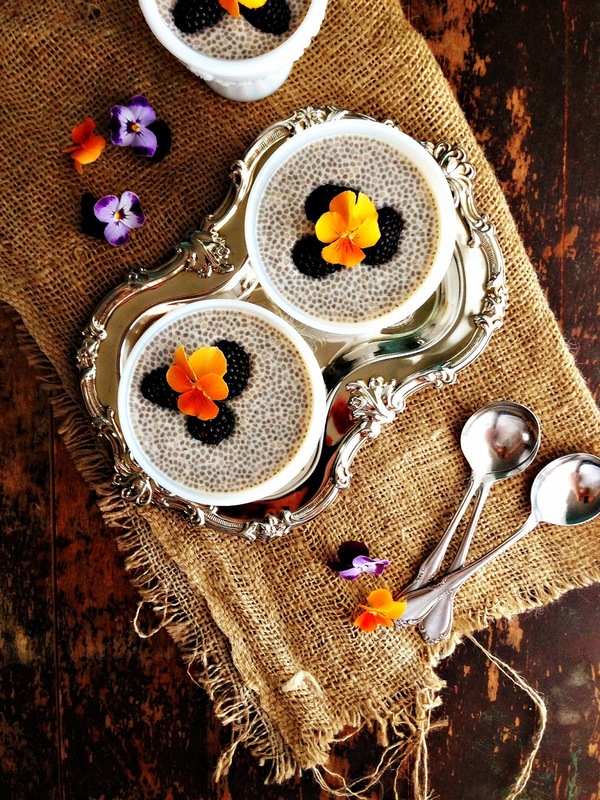 Chia pudding, pictured above, is a great way to get more chia into your life. And you really want to. These tiny seeds are bursting with loads of nutrition, like fibre and protein, but also help keep you feeling full, longer. Funny little guys, they don't really taste like much, but absorb the flavours you combine them with. And absorb they do - soaking up a great deal of liquid, you don't really need that much. I really liked this pudding - it has the texture of tapioca, and garnished with fresh organic blackberries, it makes a fine breakfast or after work snack. Combine all ingredients in large bowl. Whisk well. Refrigerate and whisk every 10 minutes, for half hour. This is so it doesn't get lumpy. After half hour, pour into 4 serving dishes, cover and refrigerate for at least 3 hours. Garnish with fresh berries. Serves 4. Recipe from Pastry Affair. I brought this tart in for my new boss and chef to taste and both of them were blown away - so much so that you can't even tell it's gluten free. Garnish with fresh berries and a little whipped cream, if you like. In the bowl of a stand mixer, mix the dry ingredients. Add the cubed butter and mix until pea sized bits of butter remain. In a small bowl, whisk together the egg and ice water with a fork. Stir in the liquid and mix until it comes together, is soft and supple, not soggy. Form into disc, refrigerate for one hour, or overnight, if possible. Preheat oven to 375*F. Let dough rest for 30 minutes then roll out on counter dusted with sweet rice flour. Fit it into 9 inch tart pan with removable bottom. Poke holes in bottom of crust. Chill for 30 minutes, then par bake for 18 minutes (see directions in the following quiche pastry recipe for par baking). Remove parchment and weights then pour in lemon filling. Bake for another 20 minutes. Let cool completely before removing from tart pan. Makes 8 servings. Pastry recipe from Gluten Free Girl and The Chef. In a bowl, beat the eggs, yolk, sugar and lemon juice. Transfer to saucepan and add the butter. Warm over low heat until butter melts, stirring constantly. Continue stirring until lemon mixture thickens, but do not boil. It's ready when it coats the back of a spoon well (you run your finger along back of spoon and the mixture holds its shape). Filling recipe from La Tartine Gourmande. I love working with these new-to-me flours. The taste is warm and nutty and perfect for savoury fillings. Use whatever quiche ingredients you like or have on hand. In bowl of stand mixer, add the dry ingredients and blend. Add the cubed butter and mix until pea sized bits of butter remain. Beat in the egg. Gradually add cold water. Mixture should just come together and form ball. Remove from bowl, form into disc and wrap in plastic. Refrigerate dough for at least one hour. If in fridge for longer than a few hours, let it stand for 30 minutes before using. Dust counter with a little brown rice flour and roll out dough into circle to fit 9 inch tart shell or pie plate. Fit crust into pan, crimp edges, poke holes in bottom with a fork. Chill for another 30 minutes. Meanwhile prep filling ingredients. I sautéed 1 cup asparagus and 1/2 mushrooms in a little olive oil. Use whatever you like. I used 3 eggs and 1 cup cream, beaten together with 1/2 cup goat cheese for filling, with fresh herbs, salt and pepper. 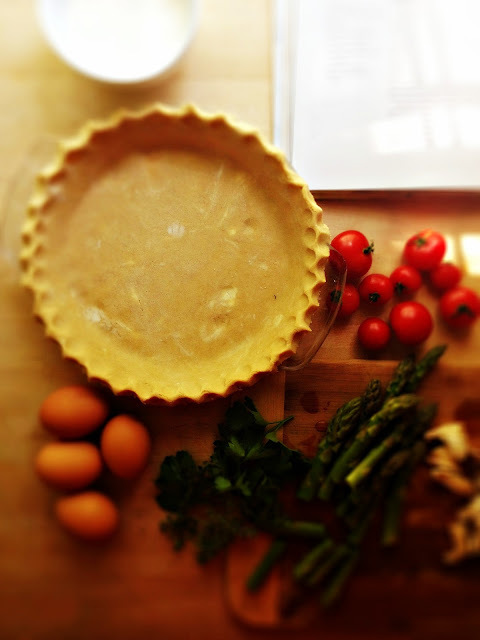 Par bake crust (place a round of parchment on top of crust and place dry beans or pastry weights on top of parchment. Be sure to fit it in the corners too. Par bake for 15 minutes in preheated 375*F oven. Remove parchment and weights. Place cooked veg in bottom of crust. Pour in creamy filling. Top with cherry tomatoes and bake for another 20-30 minutes until filling is set and golden. Makes 6 servings. Pastry recipe from La Tartine Gourmande. Gluten free bread is by far the most challenging project. So often it ends up gluey and heavy. But not this loaf. The crispy crust gave way to a tender interior with a great crumb. The trick is to let it rise in a low oven with the door cracked open. Served warm with a little butter and jam I gobbled this stuff up; one of the better breads I've ever made, including those bursting with gluten. 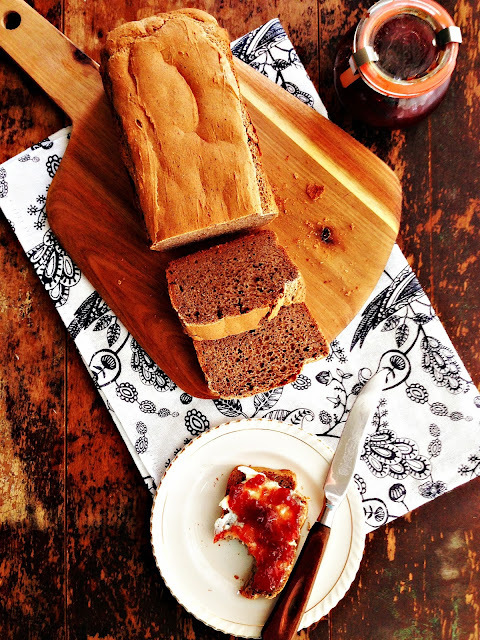 Like many gluten free breads, it's best eaten fresh the day of, or else toast it the next day. Preheat oven to 200*F. Grease a 9x5 loaf pan with olive oil. Place warm water, sugar and yeast in medium bowl and stir. Make sure water is right temp - yeast should bubble up. If it doesn't, start over. Let it stand, bubbling away for 5-10 minutes. Stir in honey, oil and vinegar. Whisk well. And there you have my big news. I've leaped big, leaving behind comfort and security, but also heaviness and dissatisfaction. I'm pretty excited about this fresh start. A brave new (gluten free!) world awaits, and I'm grabbing it by the tail. Wish me luck. Oh, and if you ever find yourself in Saskatoon, be sure to stop by Leyda's and say hi - we open to the public later this week. xoxo Renée. It sounds totally and completely exciting. I have been wanting to try a Chia seed pudding, it looks so interesting. And your lemon tart looks outstanding. Best of luck with the new gig, I am sure you will love it there. Congrats on the new changes! So exciting. Can't wait to discover this new place that shares some of my own food values. All the best!! I have been doing a lot of gluten free baking lately and I have to say my results have not been as spectacular as yours; thank heavens for your recipes - will be trying them this week! Thanks and good luck in this exciting new adventure! I have been doing a lot of gluten free baking lately, though my results have not been nearly as impressive as yours. Thanks for these recipes - I'll be trying them this week for sure! And best of luck in this exciting new adventure! Good luck in your new job. Looks like you'll have no problem being successful at it. I'm not gluten-free, but I love variety, and the tart is awesome. Micki - thanks! It really is cool (finally) working in a place that shares some of my own food values as well. And everyone is just so gosh darn nice! Sayyes... - gluten free baking is challenging, right? The successes are pure joy. I hope you enjoy these recipes too! Rosemary - I appreciate it - thank you! And that tart was so yummy! Jacquelyn - thanks lady! I'm gonna try! Good luck in your new venture - your baking creations are beautiful. Don't know if I'll EVER be able to hop on that chia bandwagon myself - I was an avid Chia Pet gardener back in the day, and my associations just aren't very, ummm, appetizing. Hey, maybe I just need to follow old Dolly's advice and be 'brave' enough to 'try'! congratulations, Renee! this place you're working at sounds amazing! a lot like organic roots back in the day. wish I could come visit! Congratulations Renee! I can feel your excitement through your words. There is truly nothing better than to be excited and inspired by your work. I'm so glad you've found that. As you know from reading my blog, gluten free is not really in my vocabulary very often :), but that said, I can appreciate the exciting challenge it must be. Enjoy your new job! Congratulations! I know you'll bring your special brand of enthusiasm and passion to this new challenge. All the best! Really, really exciting news, Renee! You are the perfect for for this. Ashley - yes! I wish you could come visit too! Aimee - you are too kind. Thank you! Congrats on the new gig! I'm so glad that you're happy you made the leap. My few, feeble attempts at gluten free baking have been very trying so I commend you. 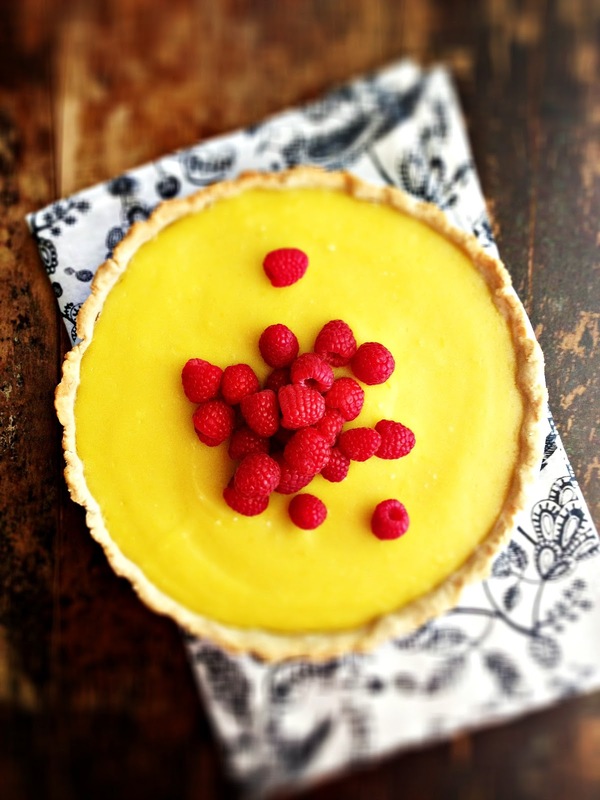 It looks like you've mastered the art of flourless baking already if that tart is any indication!